" Looking back at the twentieth century, we experienced many conflicts such as the Second World War, the Cold War and many others caused by differences of ethics, religions and ideologies, resulting in loss of lives, dignity and cultural heritage. Sadly, this happened because wealth was used as a weapon and diversity became a problem instead of causing human society to flourish. The economy should support us to live comfortably, and culture and arts should make our lives meaningful. Our organisation believes international cooperation based on learning and creating culture and art will enrich our wisdom. Osaka has been the centre of culturally important performance arts such as Kabuki and Bunraku for the past 1500 years. It has also been trading with other countries for centuries. The water from Osaka's rivers flows out into the Pacific Ocean, Indian Ocean and Atlantic Ocean, nourishing six continents and reaching all corners of the planet of water, "Earth". We strongly hope that, in the twenty-first century, music and culture from Osaka will flow out in the same way and benefit our lives and relationships and help us work closely together towards peace and a world without conflicts. 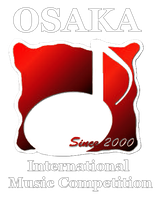 The competition was established to achieve this goal and intends to encourage many young talented musicians with their hopes and ambitions" - Executive Committee, OSAKA International Music Competition.
" OSAKA International Music Competition founded by Ms. Yoko KITANO has reached its twentieth birthday this year and the advent of the competition has given rise for the opportunity to link Malaysia to Japan. While the regional rounds have already taken place around the world in places such as Paris, Atlanta, Korea, Hong Kong etc, Malaysia was not selected until today due to the nature of the music community in the country and its unknown connections to the music society in the globe. Being a performer and commuting between the two countries for concerts, I was privileged to meet Ms. KITANO. She has always wanted to expand the competition to Malaysia, stretching opportunities to fulfill her vision but never had a chance until now. I do hope this competition will further open doors to the local talents as well as establishing connections with other musicians and peers around the world through music." 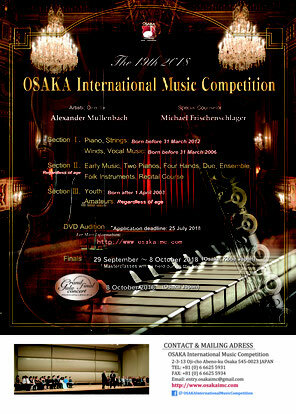 - Malaysia regional committee, OSAKA International Music Competition.